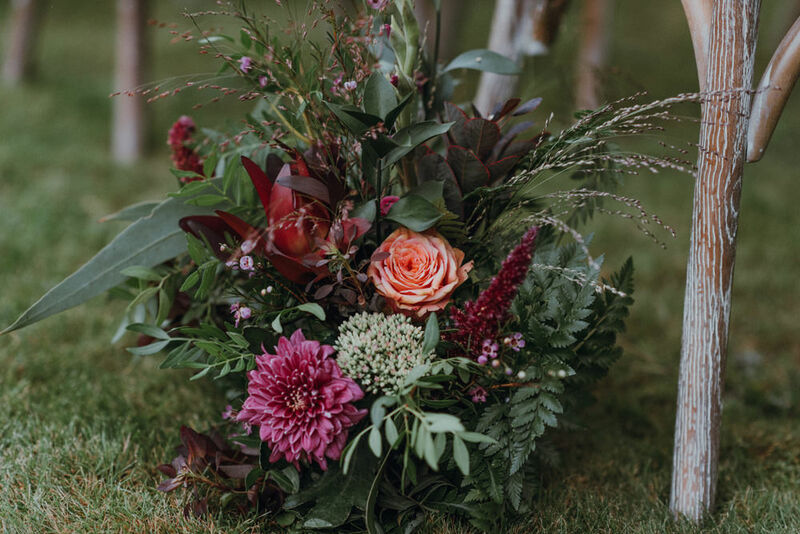 Beth had a very specific vision and a real eye for detail and boy did it pay off! 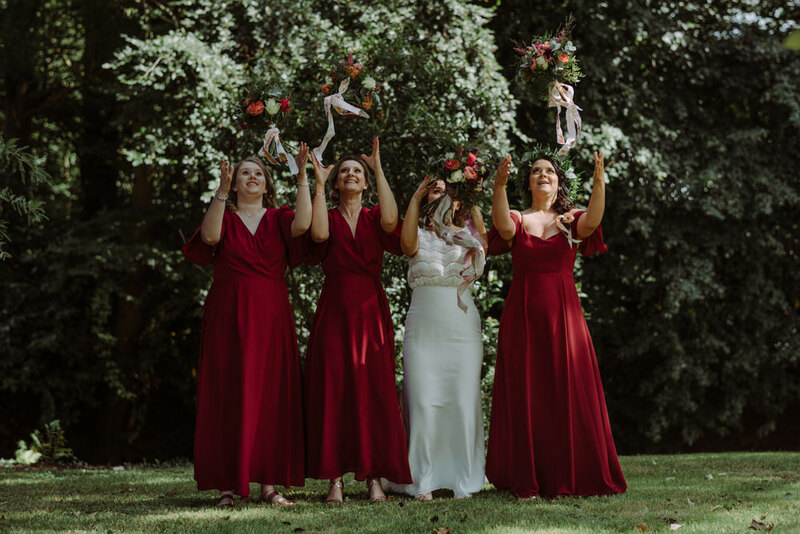 Our pair enlisted the help of a number of our Supplier Love members with Shropshire Petals confetti and beautiful bridesmaids dresses courtesy of Rewritten. 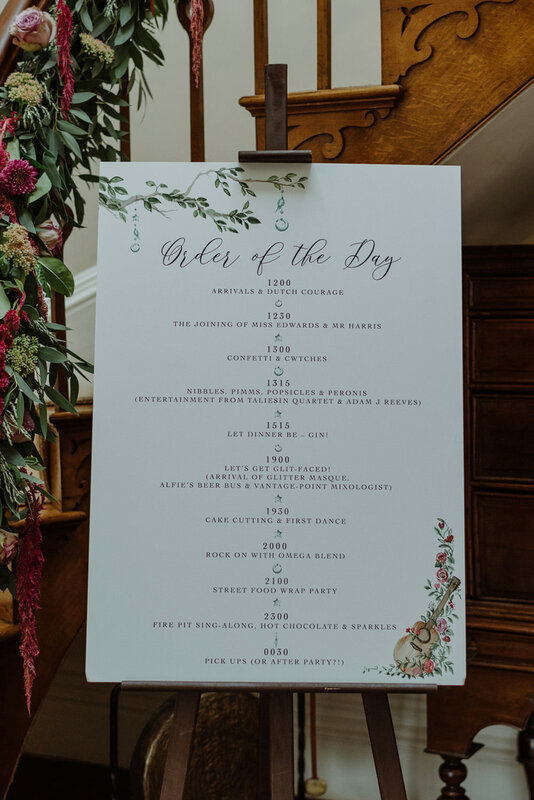 They also selected another WWW fave, Christopher Ian Photography to capture their day, and what a fantastic job he did! 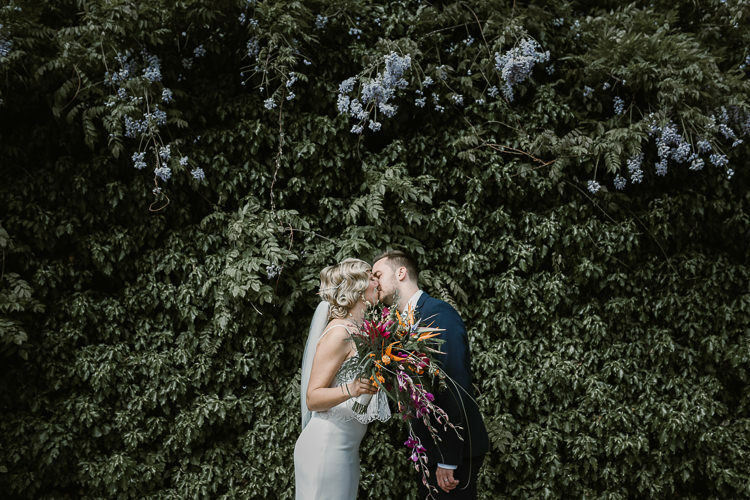 Thank you so much for sharing these gorgeous images with us Christopher. 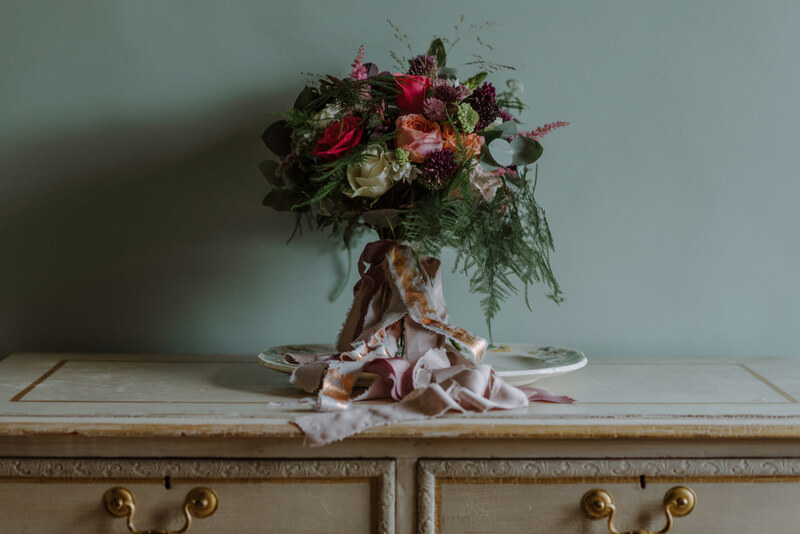 I almost don’t know where to start with all the stunning décor so perhaps I’ll let you see for yourself! I simply can’t decide on my favourites. 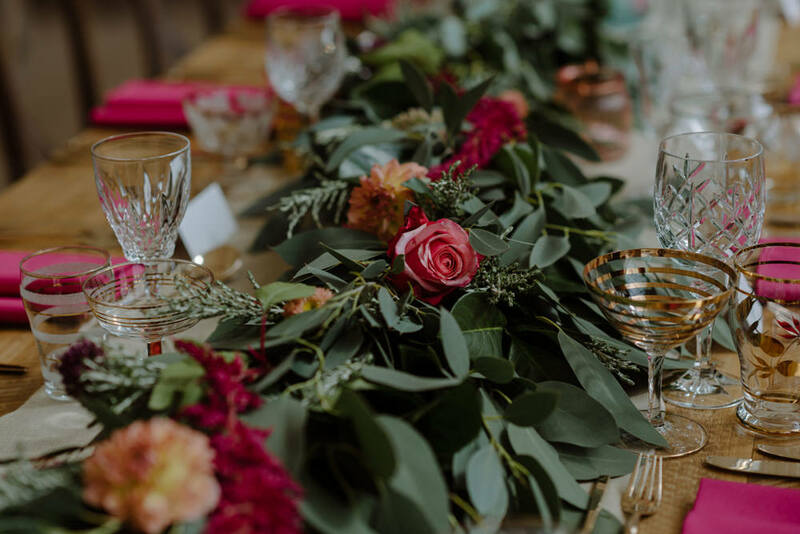 From the Persian rug aisle to the amazing cut glass tableware, this one really is a feast for the eyes! I am sure you will agree they both looked so stylish too. Wow. 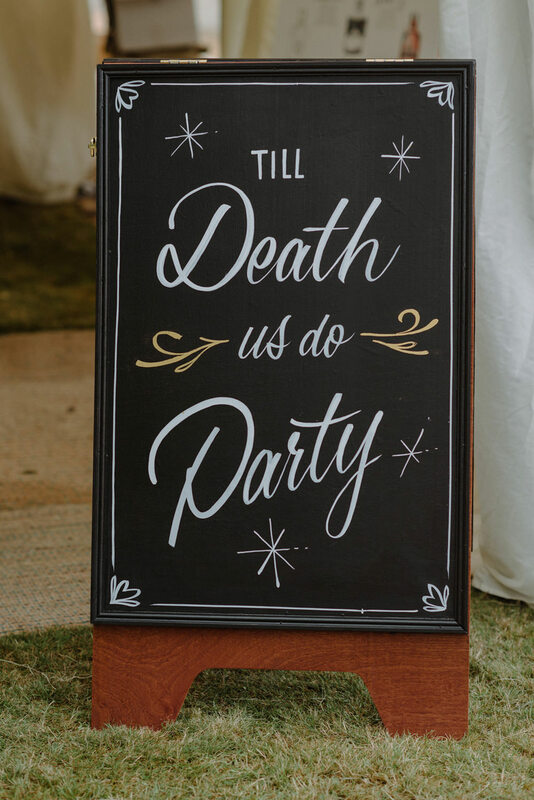 Gin in hand, barefoot on the grass, revelling in love and friendship till death us do party. 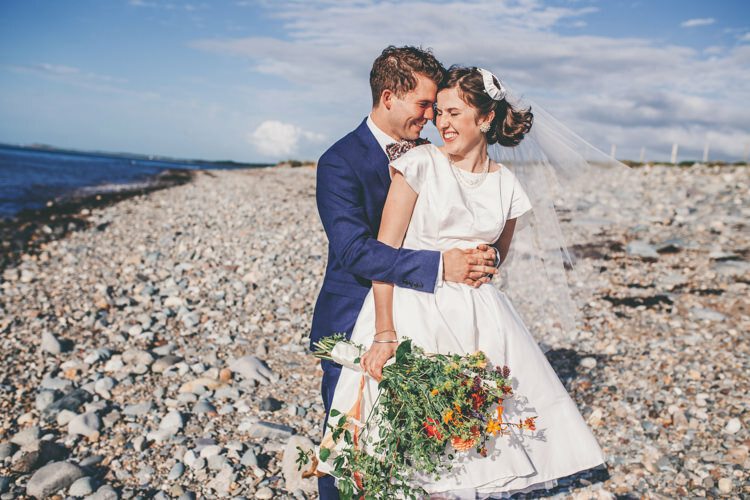 We had around two years to plan our wedding, as we knew we wanted to take our time and enjoy the process as much as possible. 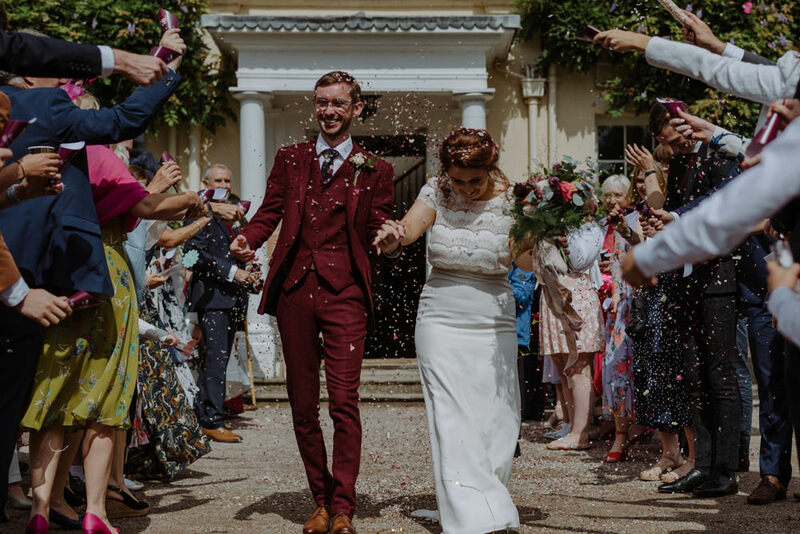 We also knew we wanted to have our wedding at the end of summer, and over a bank holiday so we could make the most of a cheeky Monday off work! 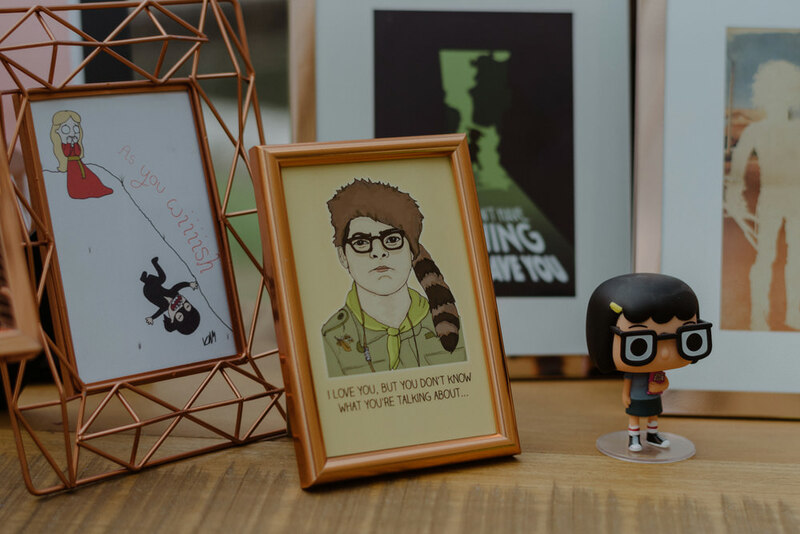 We tried to do a little bit every month so we could spread the cost and the task list somewhat, and we tried to mix it up between purchases and DIY. Of course, boys being boys, Ian left most of his tasks until the last minute! 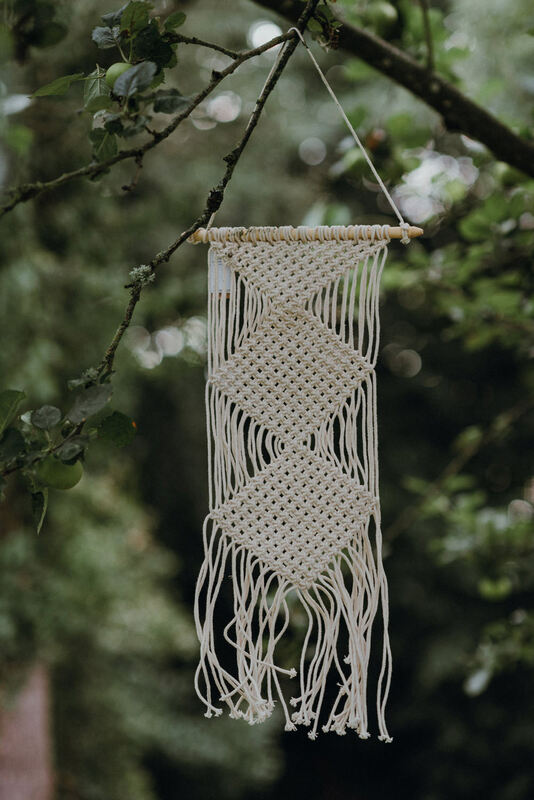 Meanwhile, I spent a lot of time on Pinterest and Instagram gathering inspiration, but also went back every now and again to delete any pins or pictures that had fallen away from our vision as it became clearer. This meant I wasn’t overwhelmed every time I looked at the boards! 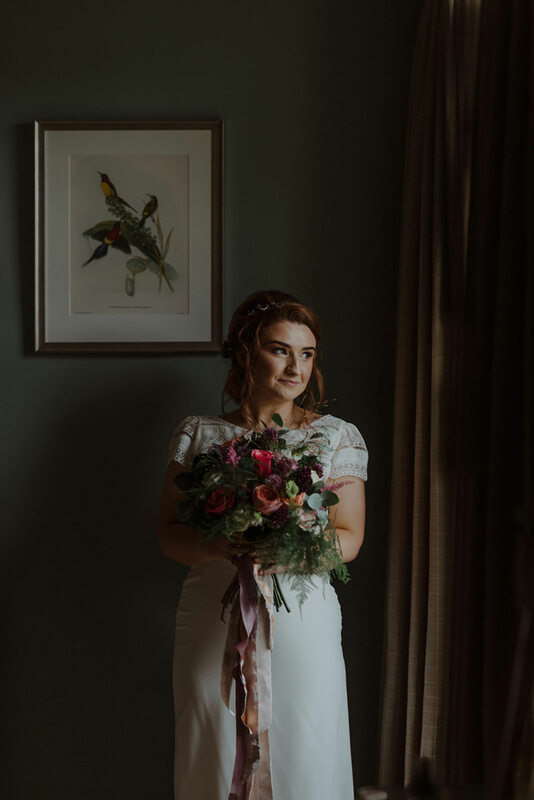 I also took a lot of advice from my vendors, particularly Kirsten from The Little Wedding Helper who I met with regularly and who helped me focus our ideas and recommend relevant vendors, this was priceless in the run up to the big day! 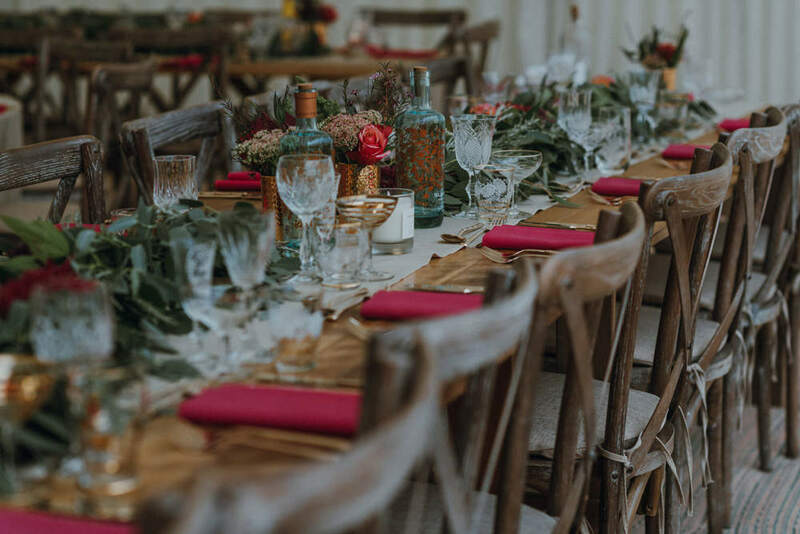 We wanted a venue that combined our love of the outdoors with a comfortable retreat for our friends and family to stay and relax for the weekend. 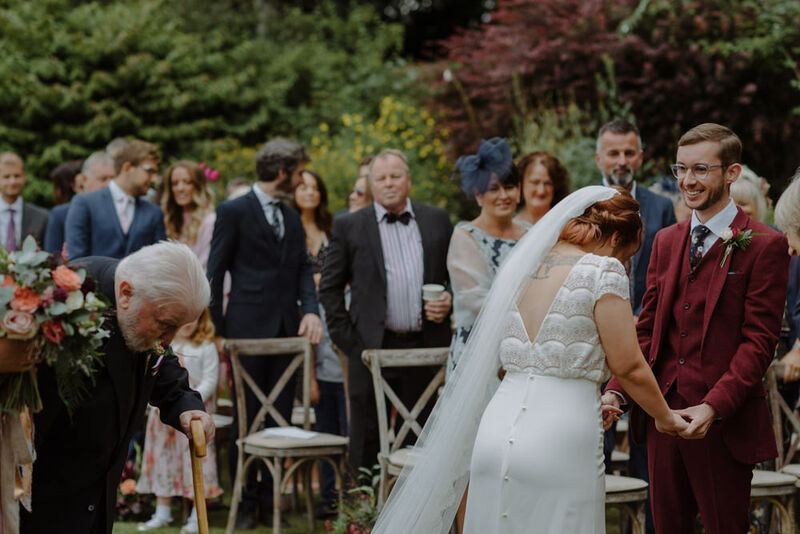 The icing on the cake was to find somewhere that allowed us to have an outdoor ceremony, and we hit the jackpot with Felin Newydd House. 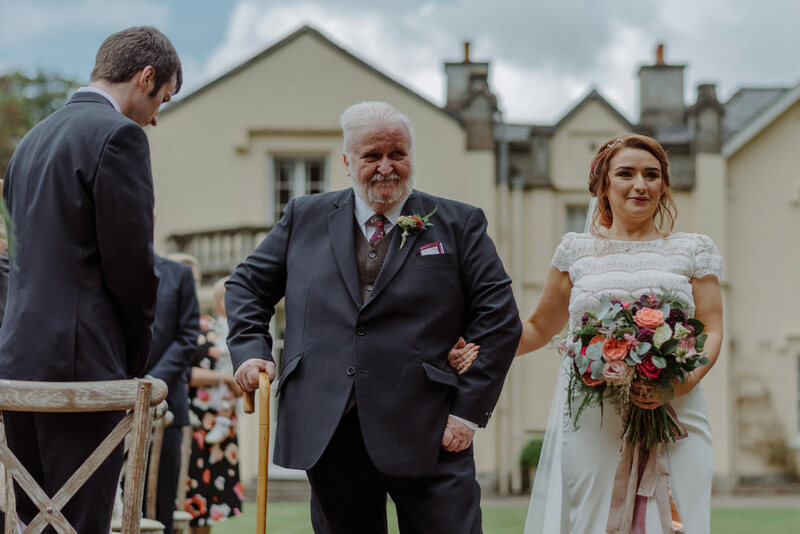 The Brecon Beacons has always been a favourite location for both Ian and I, and means a lot to me as my grandmother was born and brought up in Powys. We looked around the area quite extensively before stumbling upon Felin Newydd somewhat by accident and falling in love straight away! 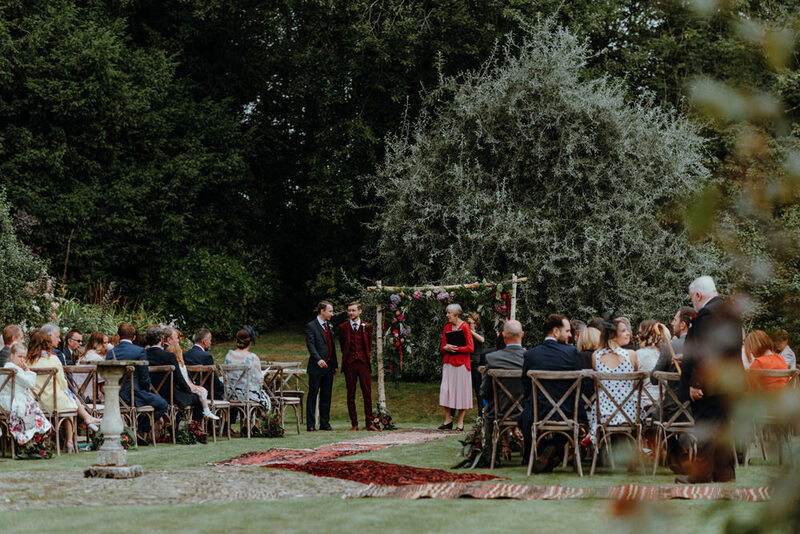 The beautiful rose garden where we held our ceremony will always hold a special place in my heart, and as the house is a private hire house, we hope that one day we can return to stay with our own children. I spent the majority of my childhood and teenage summers in France and have always been a huge fan of French bohemian fashion. 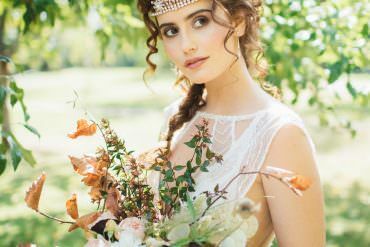 For this reason I knew I wanted to visit The Mews Bridal boutique in Clifton to try on some dresses by French designers. One of the first things I said to the manager Gail was that my heart loved Laure De Sagazan but my mind was telling me that her dresses wouldn’t love me. Gail replied ‘nonsense!’ and set about picking out some styles for me to try. 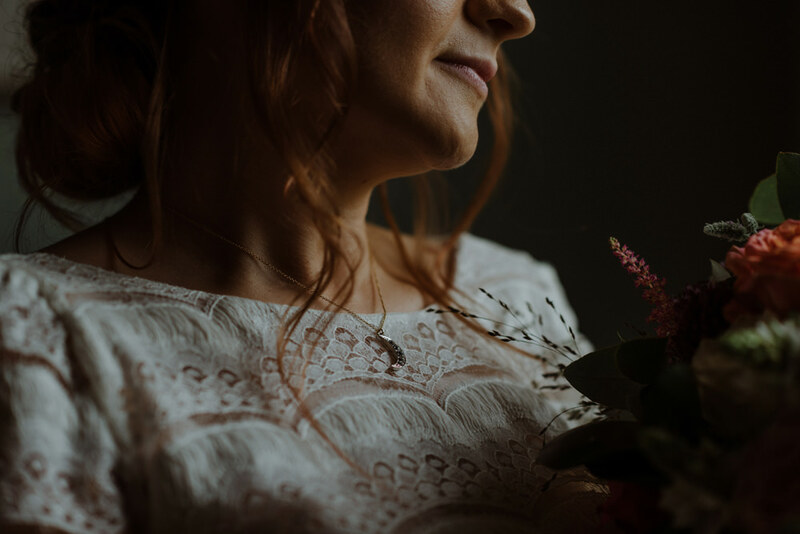 Luckily Gail was indeed correct, and I quickly fell in love with the ‘Verlaine’ dress – which felt like it had come straight out of A Midsummer Night’s Dream. 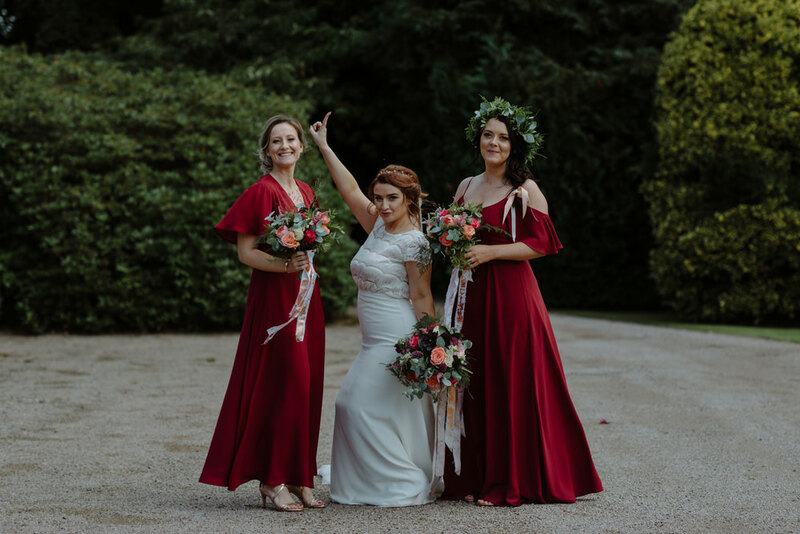 As I am a teeny tiny 5ft 1, Laure’s dresses were simple enough that they didn’t drown me, but intricate enough that they still made my heart sing! 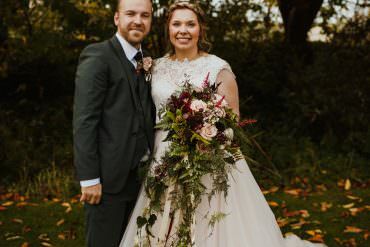 I paired the dress with a lace edged cathedral veil. 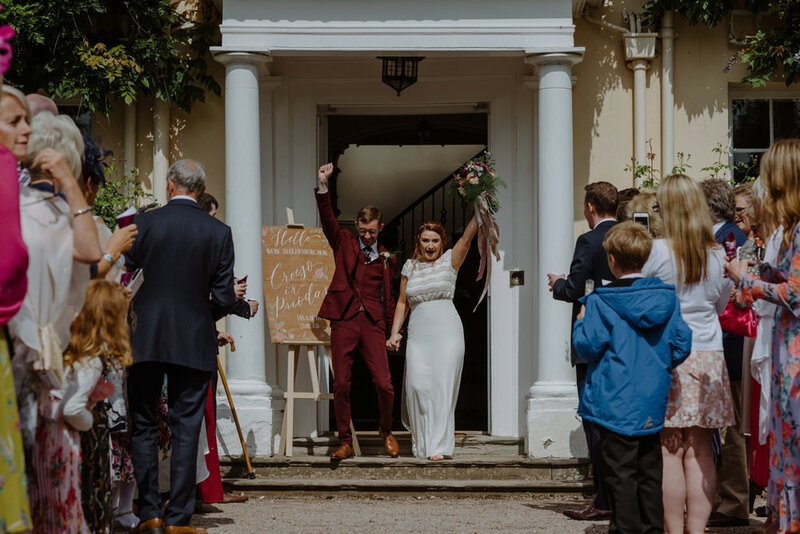 Being slightly extra however, and having a three-day wedding to think about, I also opted for a second outfit, from the fabulous Rachel Burgess Bridal Boutique in Penarth. 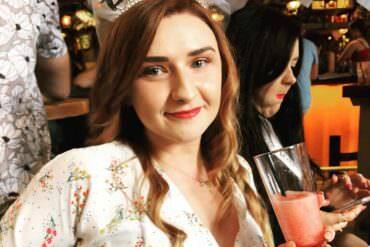 Rachel is the best mate every girl wishes they had – supportive, fun, attentive and just downright lush. I’m always really keen to support local Welsh independent businesses, so when Rachel brought out a culottes and crop top combo from E&W couture I was instantly sold! They were perfect for our Sunday BBQ and cocktail party. In terms of my shoes and accessories, I opted for a little bit of sparkle on my feet with Blondie Rose Gold Bridal shoes from Charlotte Mills. As my skirt was relatively simple it was lovely to have that little bit of detail (hearts no less!) on my feet. 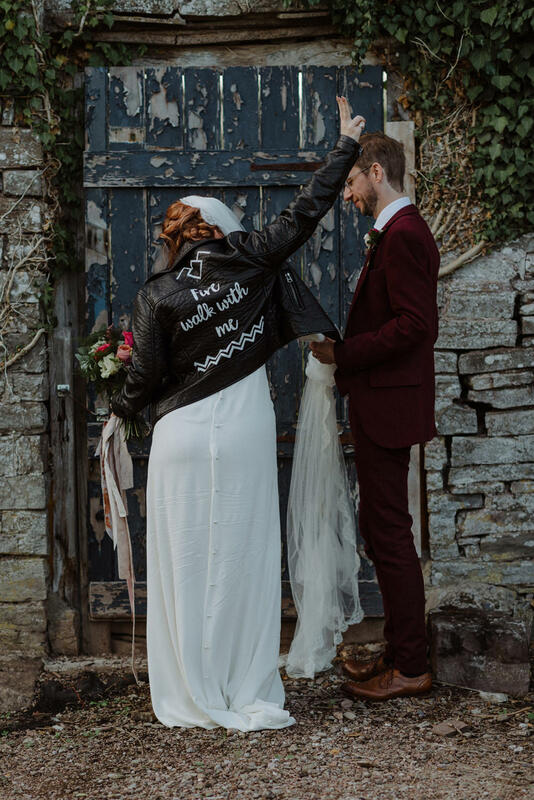 As the sun went down I wore a fabulous hand painted vintage leather jacket by Backchat designs, which featured a quote from my favourite TV show, Twin Peaks. 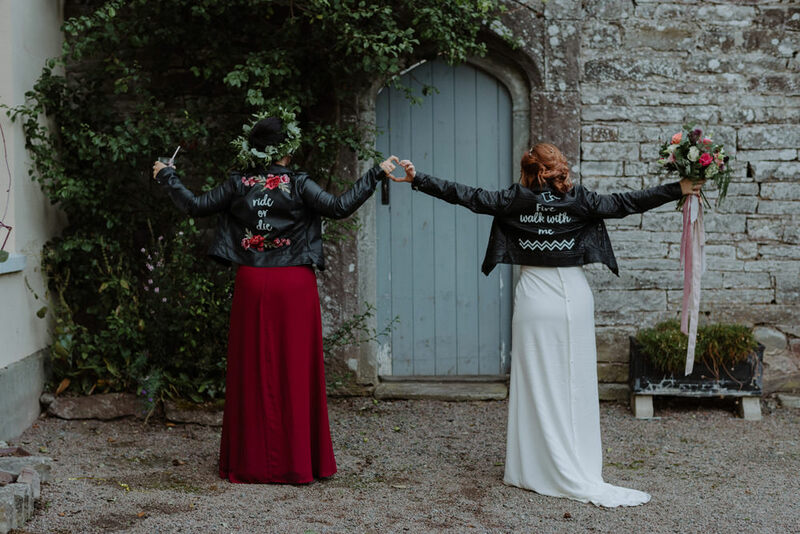 I also had one of these jackets made for my maid of honour with ‘Ride or Die’ painted across the back. For the Sunday I wore a floral headpiece by Rock and Rose. 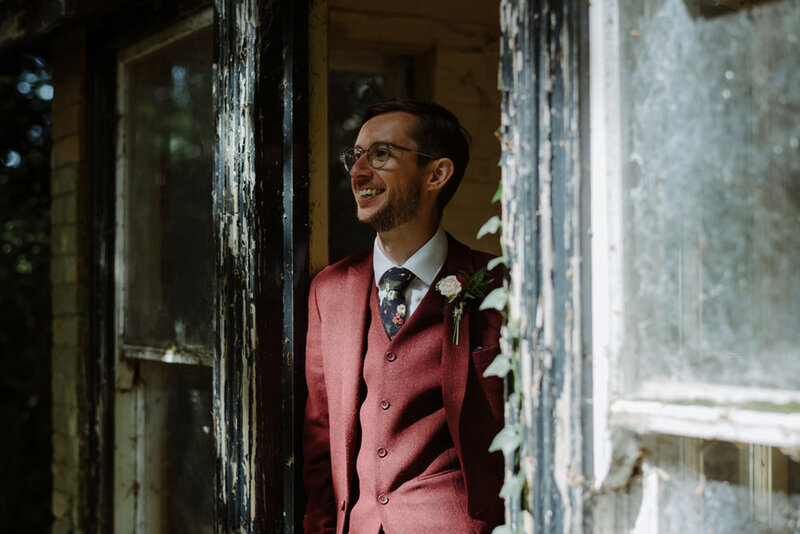 Ian is about as slight as they come in terms of clothing, so after a lot of deliberation we decided that we could potentially get a really nice suit on the high street and have it altered to fit properly. 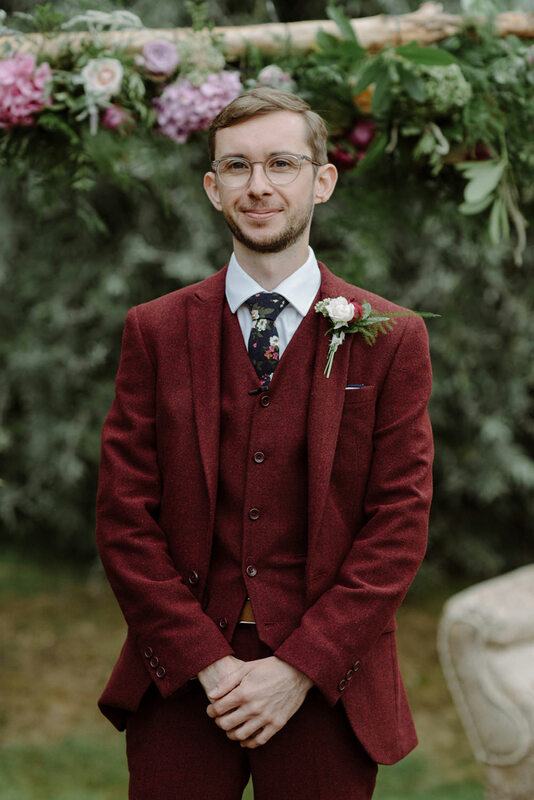 Luckily ASOS menswear do really small sizes, and because they were so reasonably priced Ian was able to buy two suits to wear across the weekend. 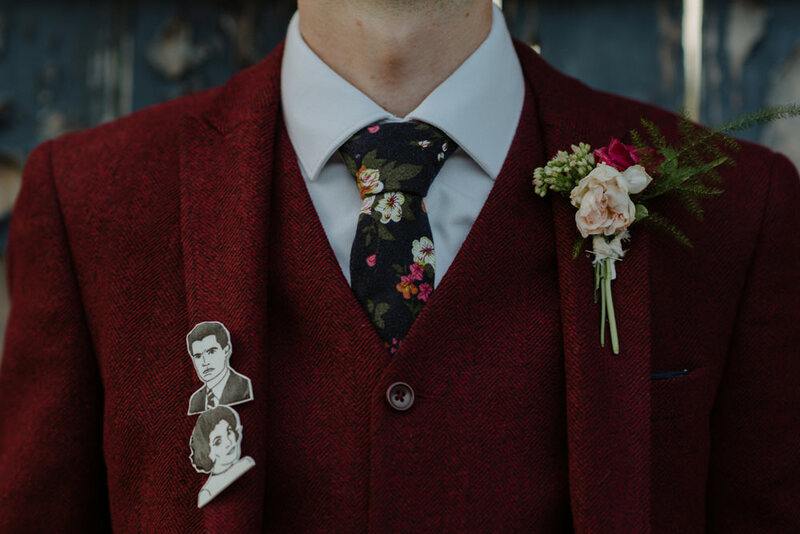 His main suit was a wool mix in burgundy, which he wore with a navy floral tie and pocket square, white shirt from T.M Lewin, and brogues from Ted Baker. I also bought him some Twin Peaks badges to wear for the evening to inject even more personality! I was lucky enough to have two very special friends on hand for hair and makeup. Shelley has been my hairdresser for years, and Jessy runs her makeup business from the back of the salon. 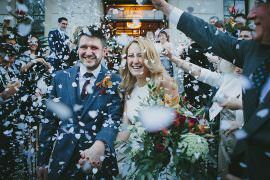 As they are best friends, it made sense for them to come together on the wedding morning! 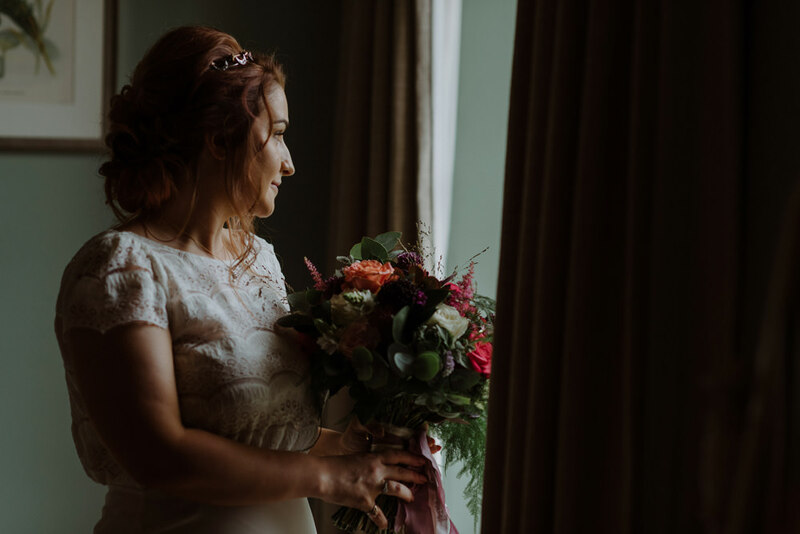 They were so relaxed and did such a good job of keeping me calm all morning – while also doing an amazing job on both my hair & makeup and that of my bridesmaids, mum, and mother in law. 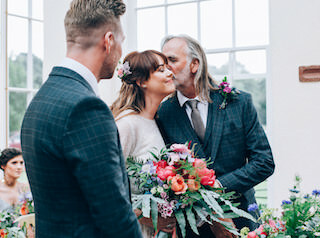 Shelley is an educator for the Milkshake hair brand and she created a bespoke rose gold hair colour just for the special day – I had so may compliments! My nails were courtesy of Apple’s Beauty – I went for a heart detail to match my shoes! Ian’s brother Chris and best friend Grant were best men, while my brother Tom, Ian’s brother in law Ashley and another of our friends Dai were the groomsmen for the big day. 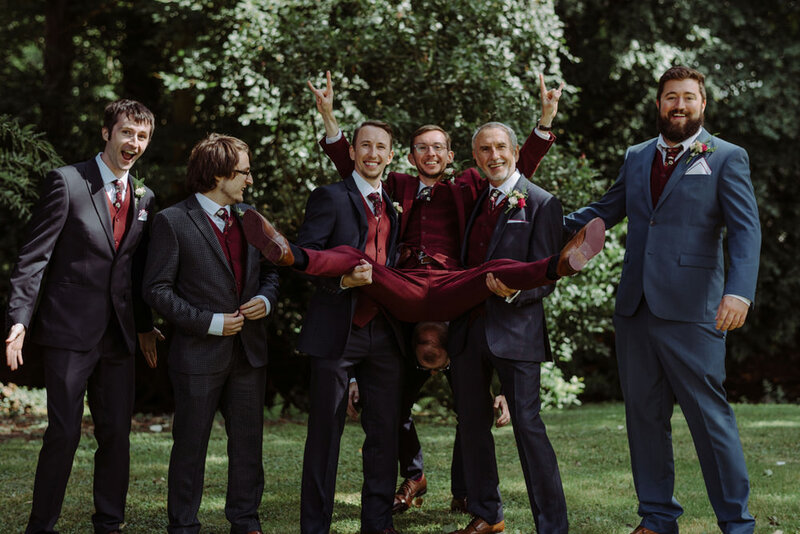 The groomsmen wore a variety of navy suits, we didn’t want them to have to wear a suit they would never use again so they all chose their own suits and we co-ordinated with a burgundy waistcoat from Asos, burgundy tie and burgundy pocket square, this looked really nice next to Ian’s burgundy suit! Both Ian and I are huge fan of Rob Ryan and his artwork, so I reworked the words from ‘This is for you’ for my mum to read during the ceremony. My mum surprised everyone as she translated the last few sentences into Welsh, which was a really special moment. 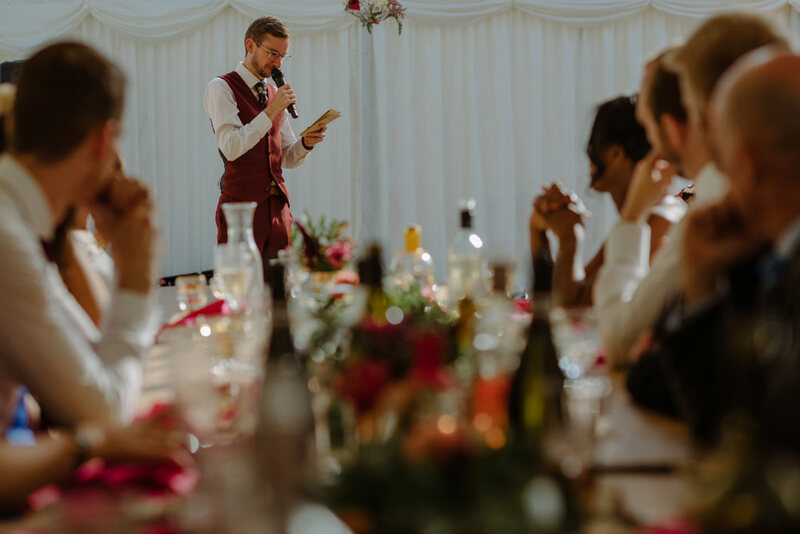 Ian’s best man also wrote a reading for us, a complete shock to me on the day! It was called ‘In the seam’ and was read by Ian’s mum. It is now framed in our living room to remind us of the special day. 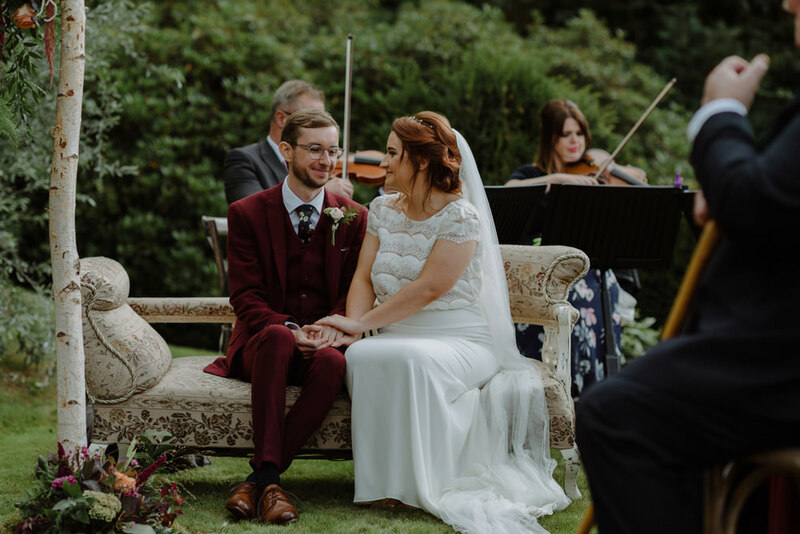 As for the music, I surprised Ian with an arrangement of one of our favourite songs ‘Waves’ by The Dear Hunter – which Taliesin string quartet played as I walked down the aisle. 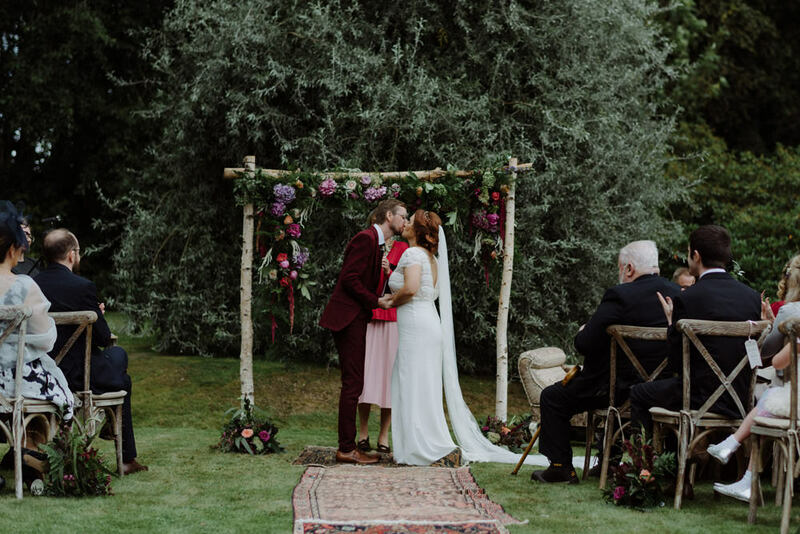 Other songs in our ceremony included Holocene by Bon Iver, Kissing you by Des’ree and Tonight Tonight by the Smashing Pumpkins. 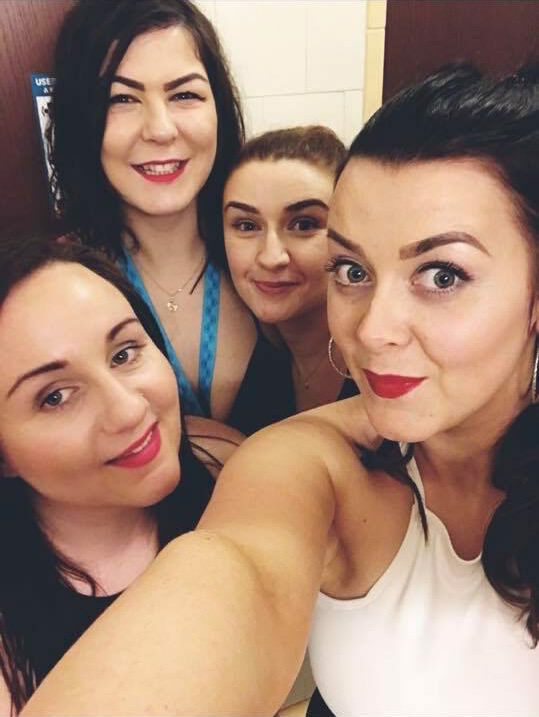 The quartet stayed on to play a selection of our favourite music throughout the drinks reception – Iron Maiden was a particular hit! We walked in to the marquee to ‘Hand Can Not Erase’ by Steven Wilson before playing a compilation of TV, Film and Video Game music throughout dinner. This went down really well with guests, it was a great icebreaker as people tried to work out which song was from which film and so on! 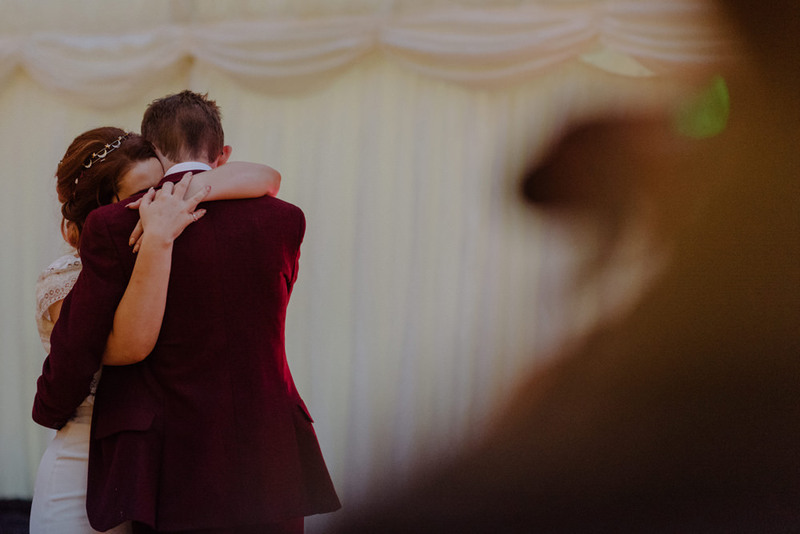 Our first dance was to ‘Power of the heart’ by Peter Gabriel, and then our guests danced the night away to our band, Omega Blend. Ian went to university in Bristol, and it’s somewhere we like to spend a lot of our free time. We both love how Bristol has so many independent food outlets – particularly at St Nick’s market in the city centre. Thankfully this is where we came across Ahh Toots! 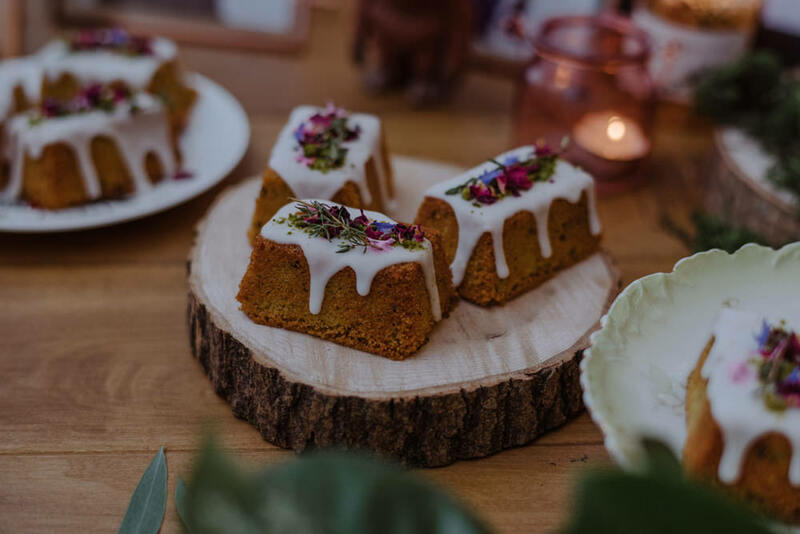 Tam is a master at her craft; each of her cakes somehow manages to look like a piece of art whilst also tasting like pure heaven! However, this did mean we struggled to make a decision on flavour! So, we ended up with gin and tonic, Victoria sponge, banana salted caramel and orange and Earl Grey. Oh, and mini friands and lemon loaves for our vegan guests. And yes, it did ALL get eaten! I was introduced to Rachael from Sweet Peony somewhat by chance, although now I call it fate! From the word go she knew exactly what Ian and I were looking for. I’ve never met anyone so knowledgeable and passionate about flowers. 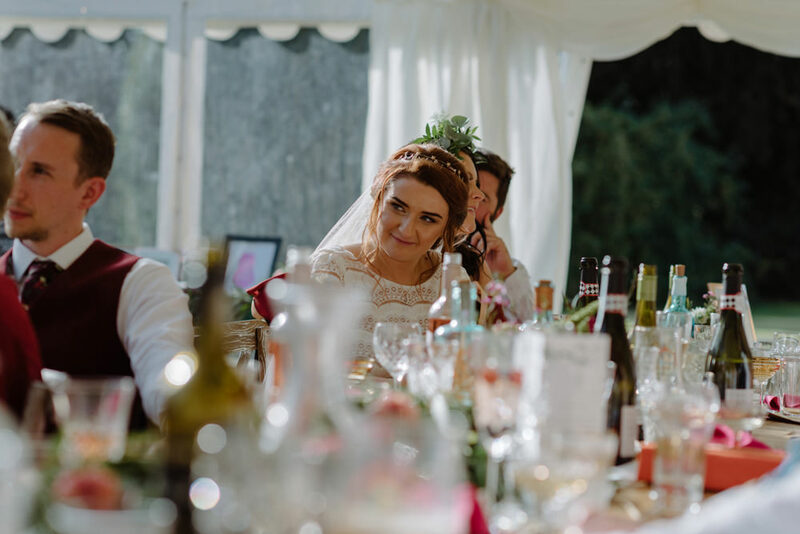 Rachael kept our vision in her head from the first meeting until the big day, and when she arrived to set up everyone commented on how fabulous she was, and hardworking. 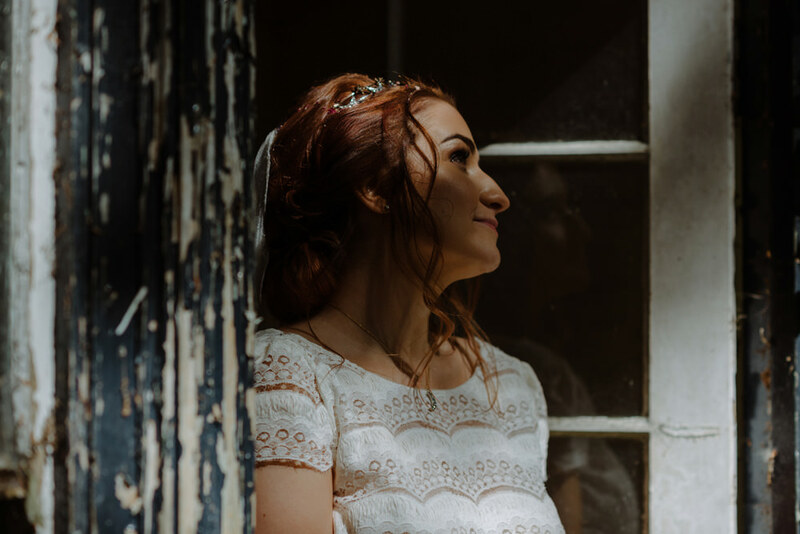 Rachael is someone who I feel blessed to have met on the wedding journey – and I would recommend her in a heartbeat. 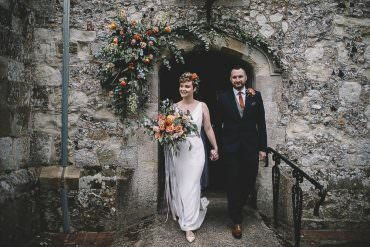 Seeing my bridal flowers for the first time was without doubt one of my favourite moments of the day – and they lasted for over week at home! I think food and drink was probably our biggest indulgence across the weekend. Ian and I are obsessed with food, so we knew this was one area where we wanted to invest. Clever Chefs were our main caterers, and they worked to within an inch of our brief to create some amazing food throughout the day. 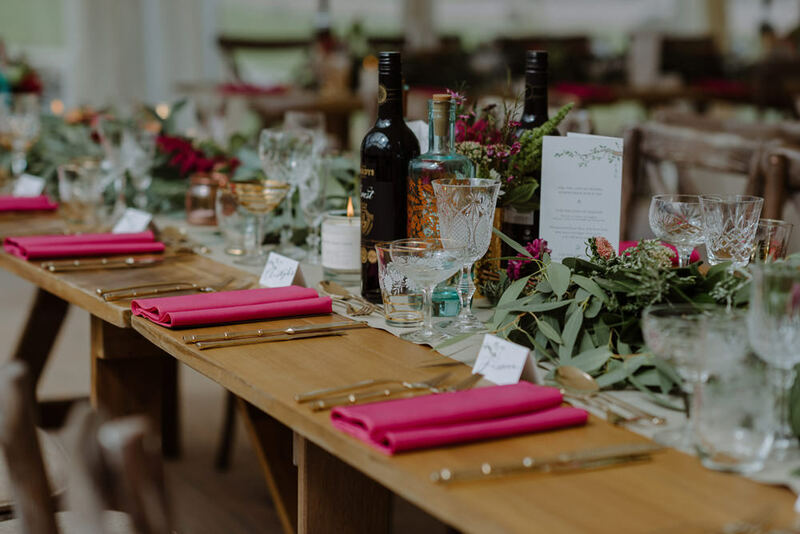 We themed our main wedding breakfast around three of our biggest loves; travel (Mexican fajitas), family time (BBQ boards) and our friends (naughty but nice Eton mess!) For the evening we had street food in the form of Lebanese chicken wraps from a trailer, accompanied by boozy milkshakes and cake! 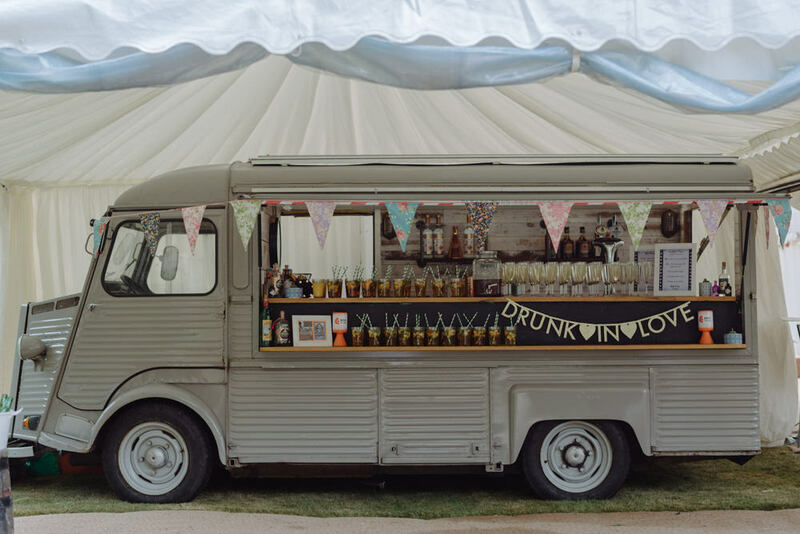 The next day we invited the boys from Ffwrnes pizza to come along and cure our hangovers – and their delicious woodfired pizzas surely did that! As for drinks – Elizabeth from pop cycle handed out Gin and Tonic ice lollies to guests alongside the canapés, Grant and his team from Vantage Point were on hand throughout the day in their amazing converted Citroen bar – serving guests our literary themed cocktails, and Paul and Hollie from Alfie’s beer bus popped along for the evening to serve Welsh craft ales from their little bus! My school friend Stacey was my maid of honour, while my two sisters in law Jessica and Kate were on hand as my bridesmaids. 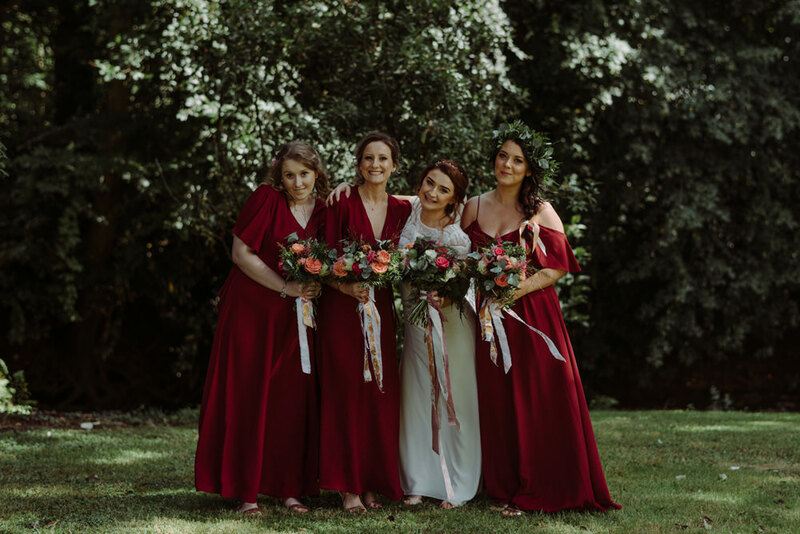 They wore Chianti coloured dresses in a range of styles to suit their personalities from the wonderful Rewritten bridesmaids. 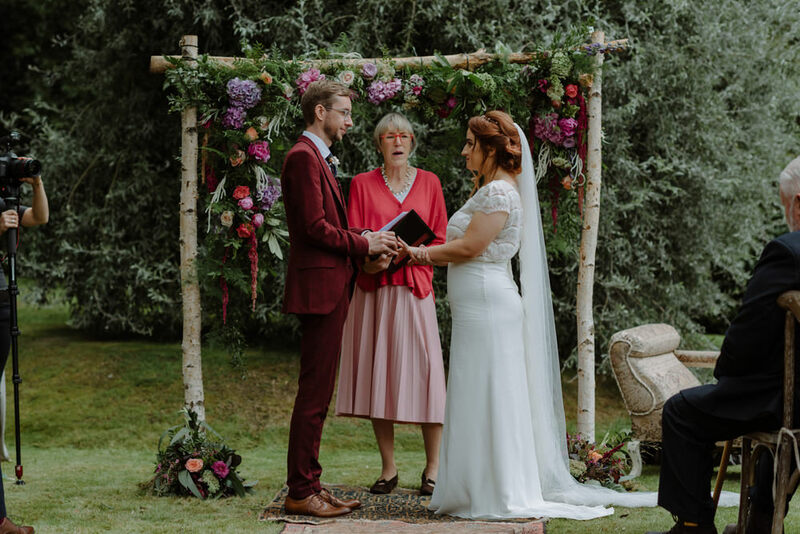 Their shoes were from Dune and they all had matching star necklaces from Tilly Thomas Lux, to co-ordinate with my Jewellery. My flower girl Matilda wore a lace and chiffon dress from Monsoon. 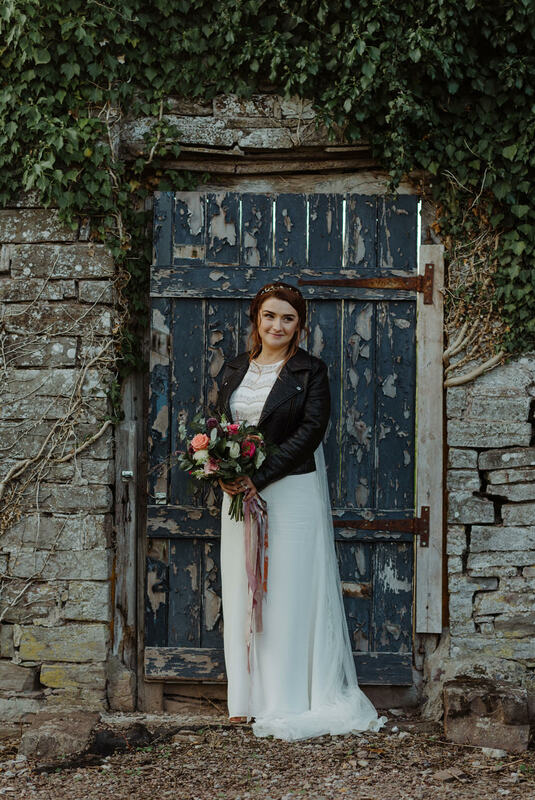 Our wedding photographer was one decision we didn’t struggle over. We saw Christopher Ian’s photographs whilst looking at another venue. 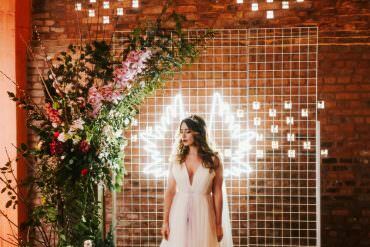 We only went to see the venue because he made it look so amazing in his pictures! 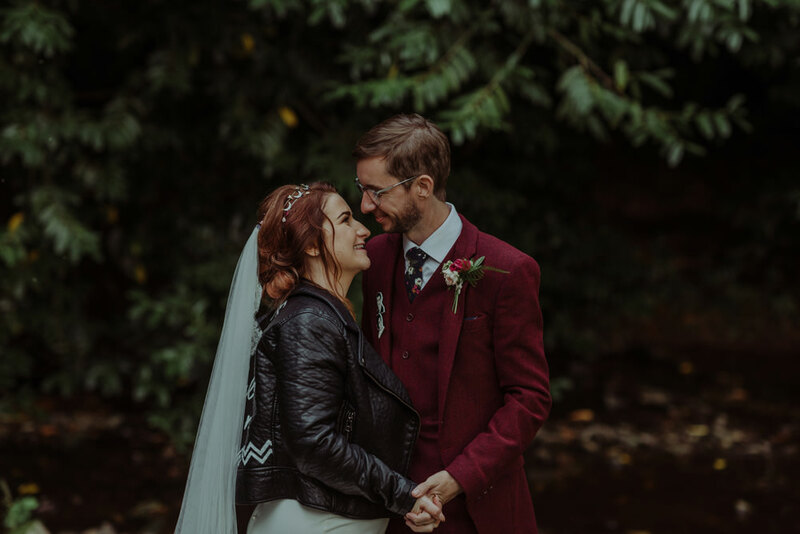 Chris shares a love of all our favourite things, the great outdoors, video games and Twin Peaks – so he was a natural fit for our big day. 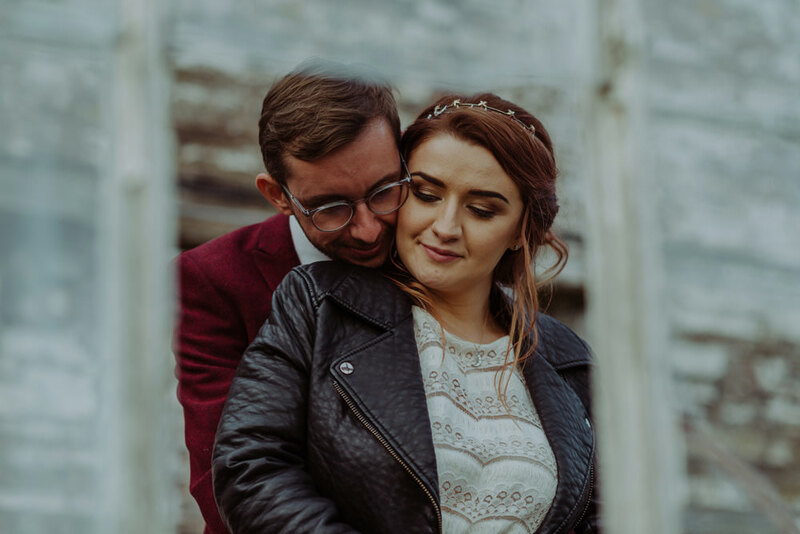 We had a wonderful trip to the Isle of Skye with him for our engagement shoot in November 2017, and everyone commented on how fab he was at the wedding. 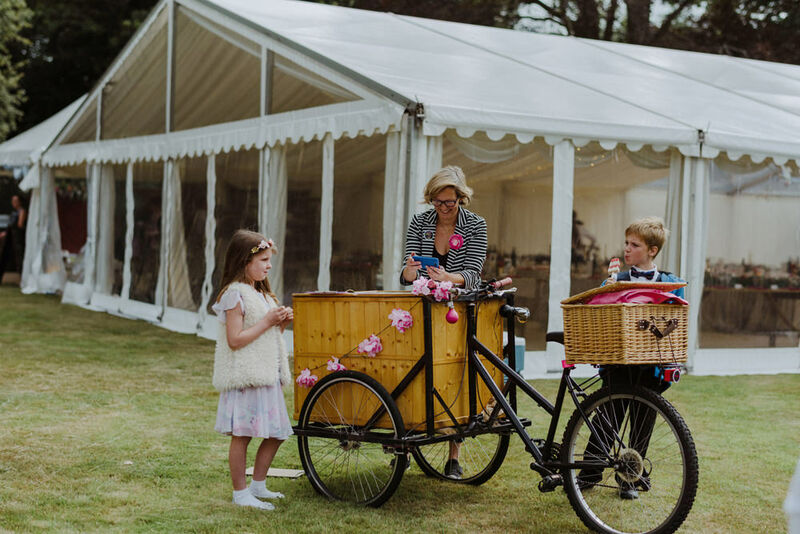 Chris is one of the vendors we feel really blessed to have met, not just for our wedding but also as a friend going forward. As a former television producer, I’m lucky to have a lot of very talented friends who can do amazing things with videography. One of those people is Hannah from Lacewing Media. 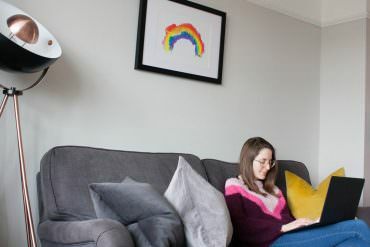 Again this was a really easy decision for us as I’ve always admired Hannah’s work. 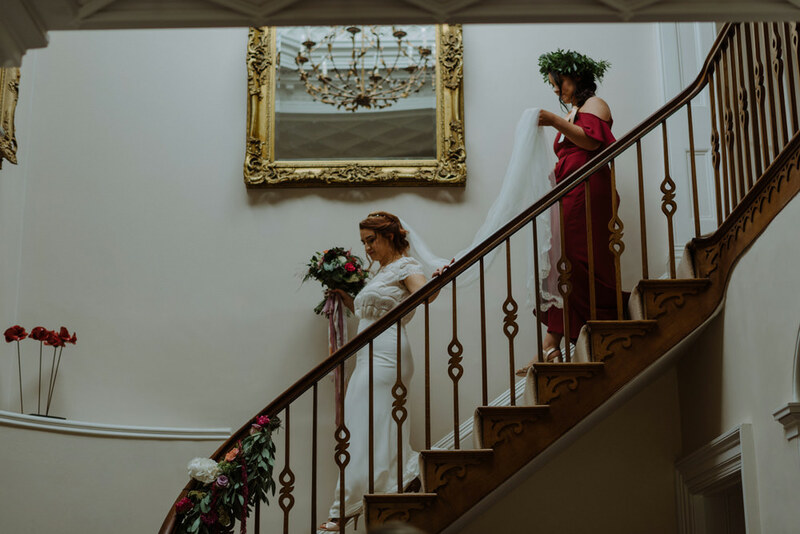 Her own friend Anna accompanied Hannah on the day and we were absolutely blown away by how hard they worked – and with the final edit of our wedding video. 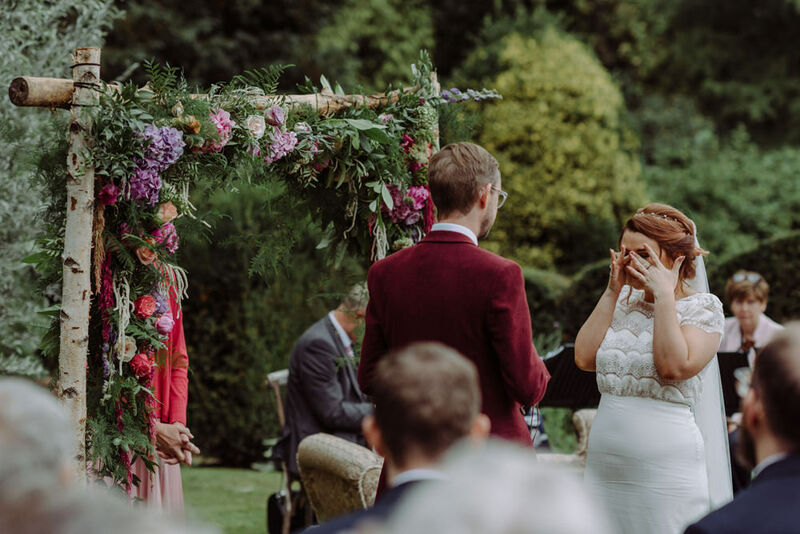 Re-watching our wedding vows at home was incredible, if not a little tear jerking! I’m an absolute demon for detail, so it took quite the team to bring the vision together! I knew I wanted to bring the indoors out and vice versa, so arranged for a truck full of Persian rugs to be driven from Cornwall by Virginia’s Vintage Hire. 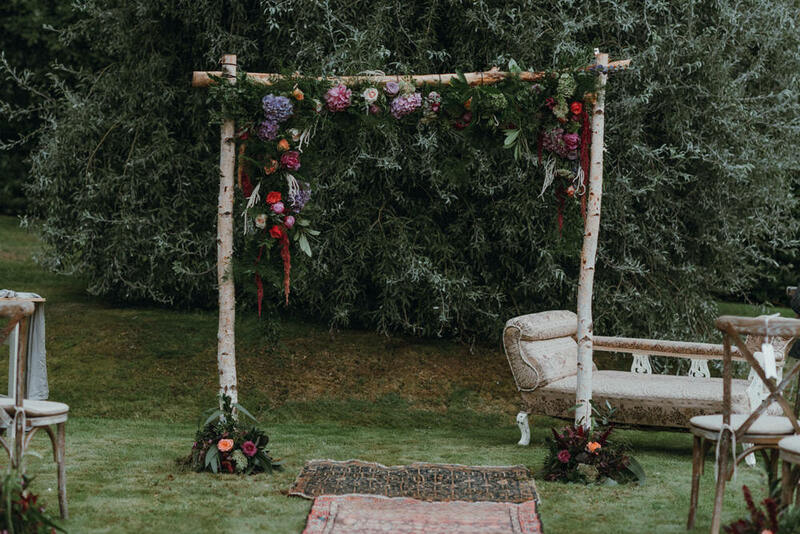 These lined the ceremony aisle, and then created lovely spaces for people to sit on the grass and enjoy throughout the day. I probably bought a new cushion every time I did a supermarket shop, so these were also laid out on the lawns, as were 40 hay bales covered in blankets and beach towels. We bought three big fire pits to place on the lawns, the bonus being that these are now in our garden! 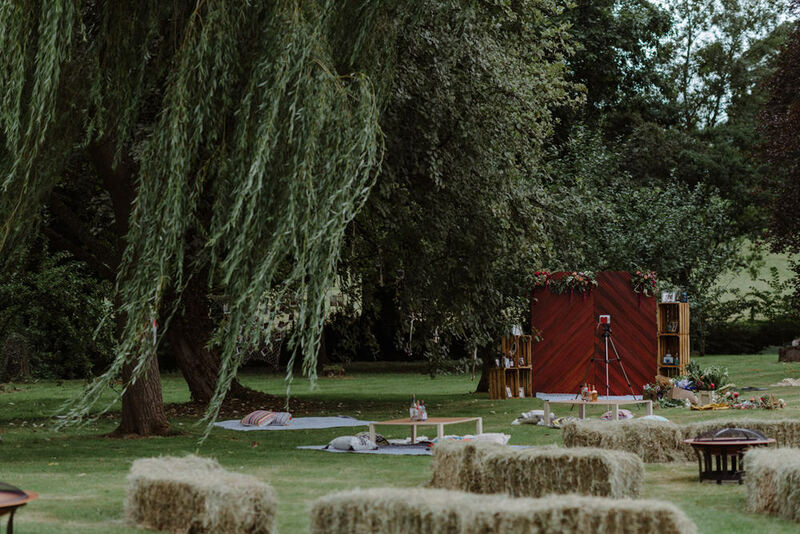 We hired a vintage chaise longue from Leisa at Beatrice Ambery, which was lovely when placed under the willow tree, next to a lace tipi which the children loved playing in throughout the day. 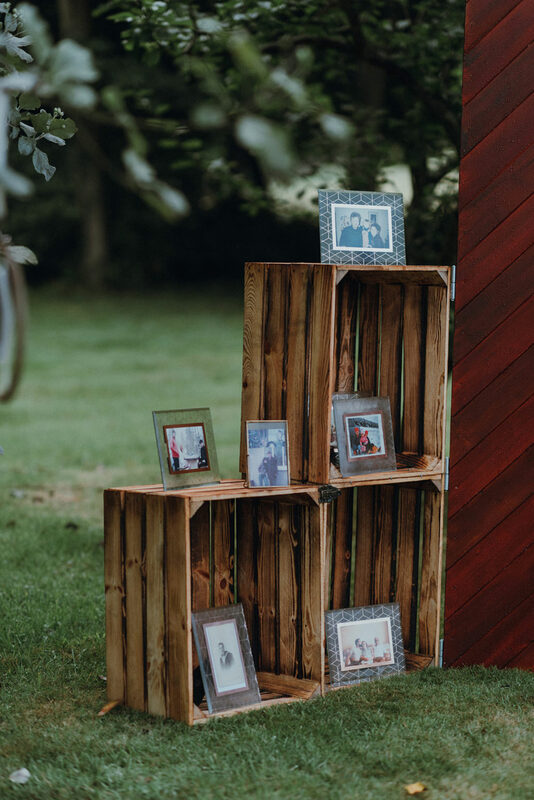 Ian also put his DIY skills to good use, making us a wooden backdrop to use as a photo booth. 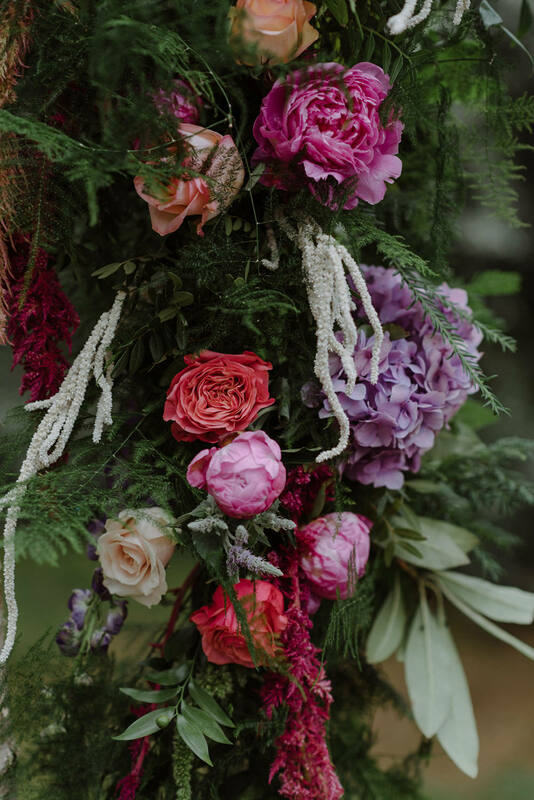 This was really popular with the guests and looked so pretty with the garland our florist made, and with all the family photos I framed to go around it. 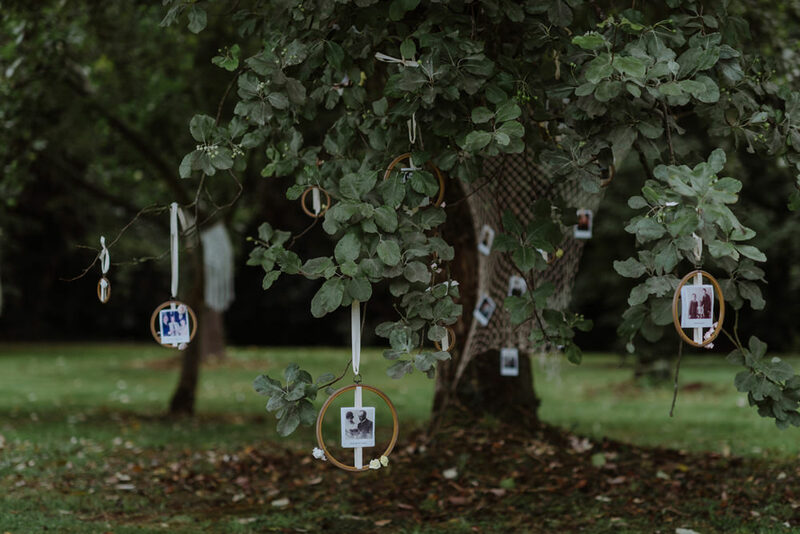 We also made use of the beautiful trees in the garden by making dream catchers and floral hoops filled with family photographs to create a literal ‘family tree’ – this was one décor element that all the guests commented on. I’m a really big fan of scented candles, and really wanted to create a signature scent for the day. So I enlisted the help of local candle maker extraordinaire Kirsty from Thornbush Hill candles in Bridgend. 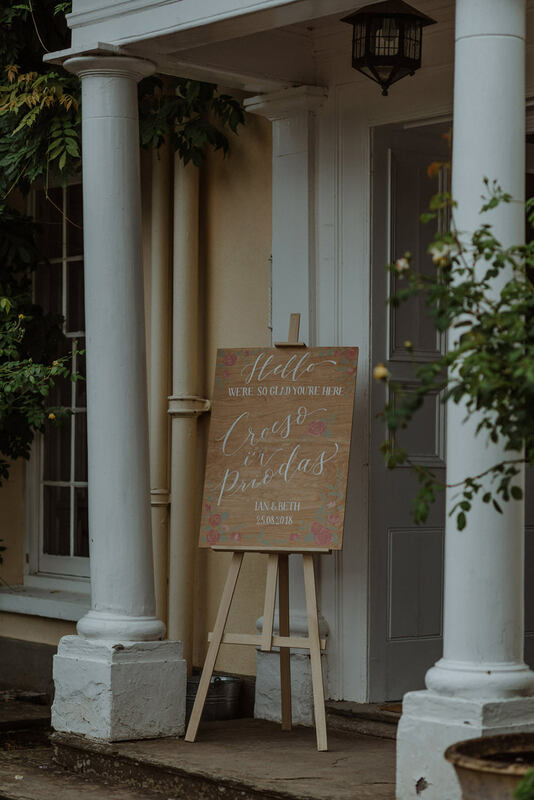 Kirsty filled our marquee with the magical smell of Cuban oak and tobacco. 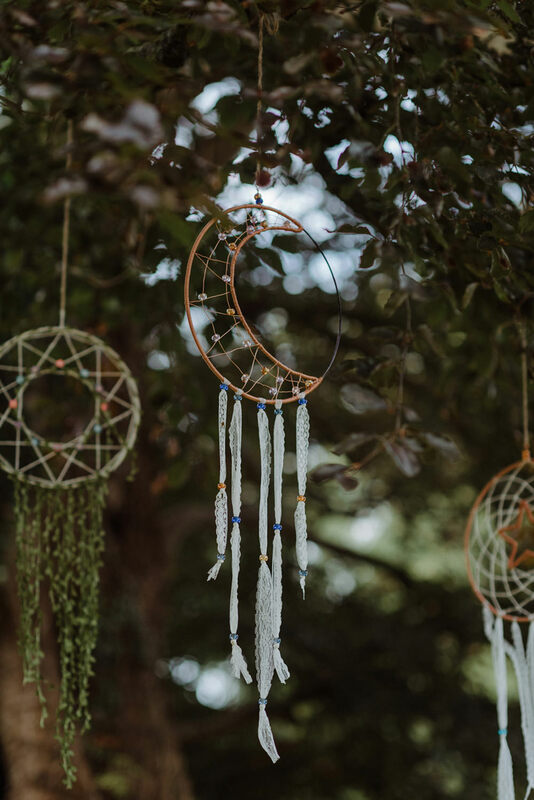 We brought some home with us, and now every time we light one it’s like being instantly transported back to the most wonderful day of our lives. 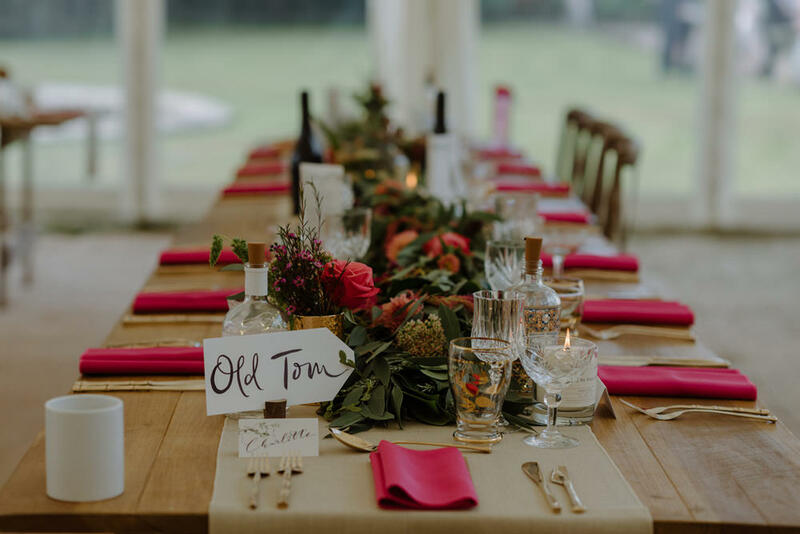 Speaking of the marquee, one guest said our tables were ‘the most insta worthy’ they’d ever seen – which was the highest of compliments for me! 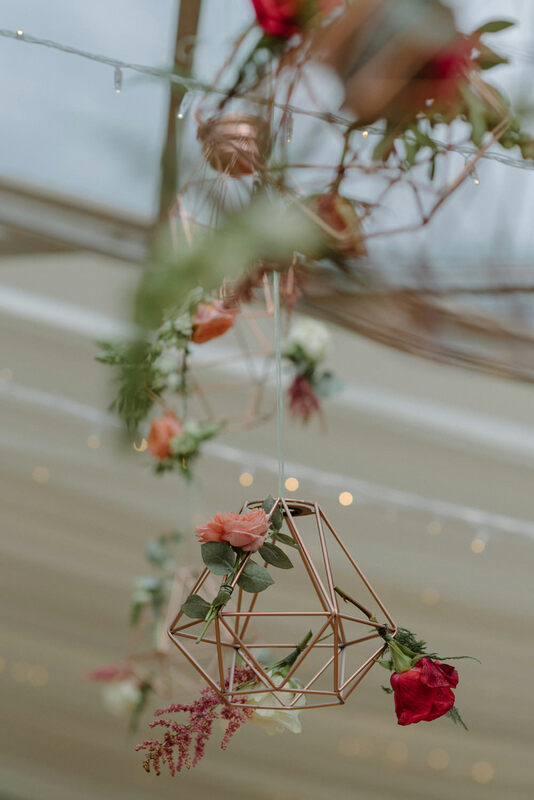 I wanted everything to look like it had been taken over by nature – so lots of trailing foliage, flowers woven through geometric shapes in the ceiling of the marquee and lots of little jars overflowing with flora. 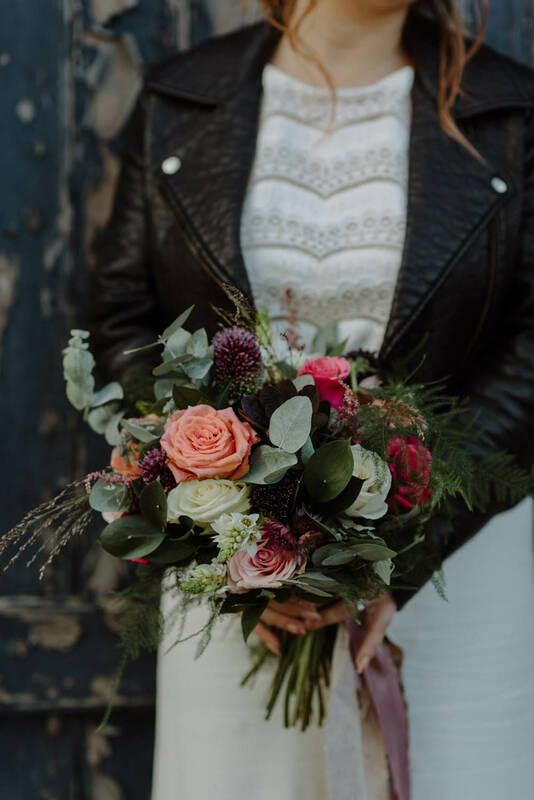 Again, Rachael and Kirsten absolutely nailed this for us! 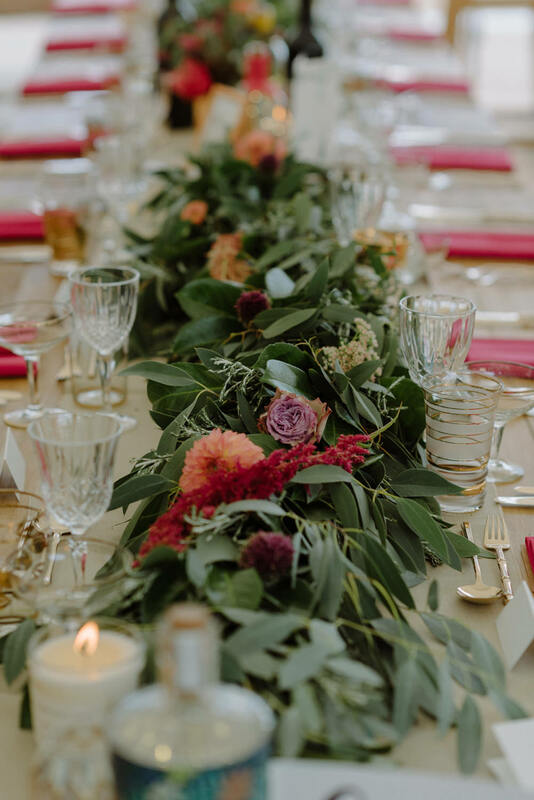 We paired the flowers with linens from 88 Events, and the most glorious vintage cutlery and glassware from Beatrice Ambery. 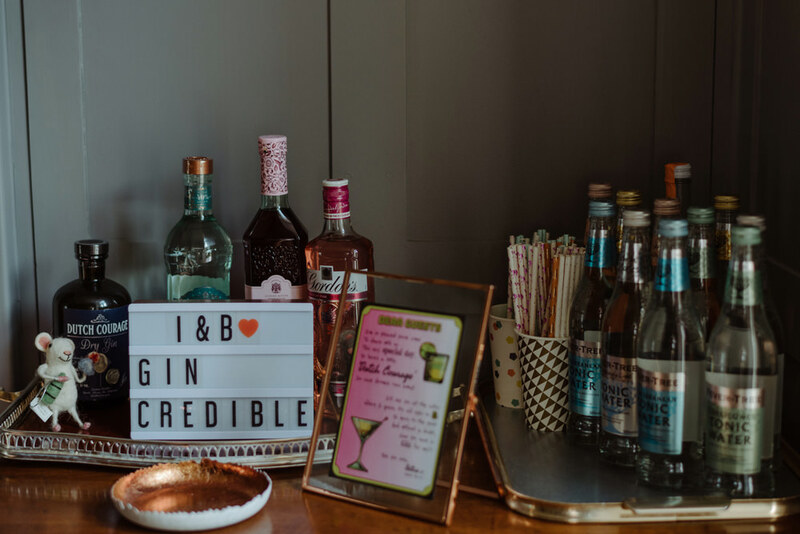 We named each of our tables after a bottle of our favourite gin, and created a homemade gin lamp to correspond to each table. 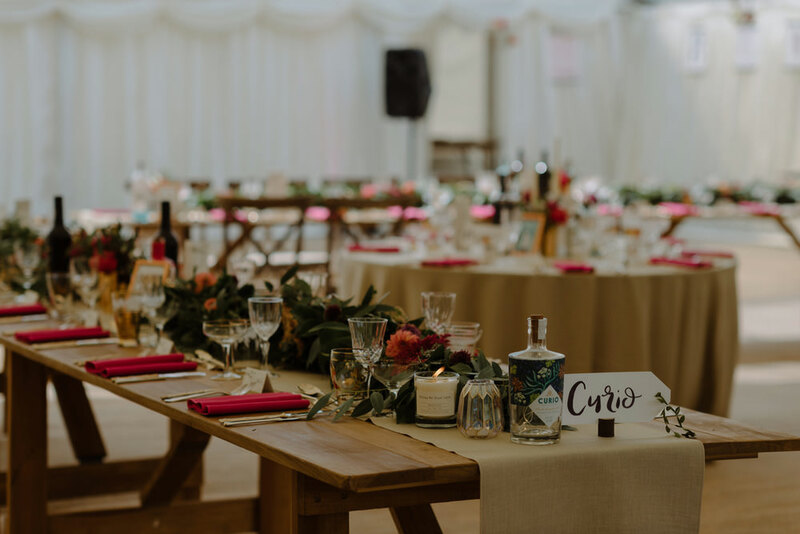 The top table was naturally Harris gin as this is our married surname! 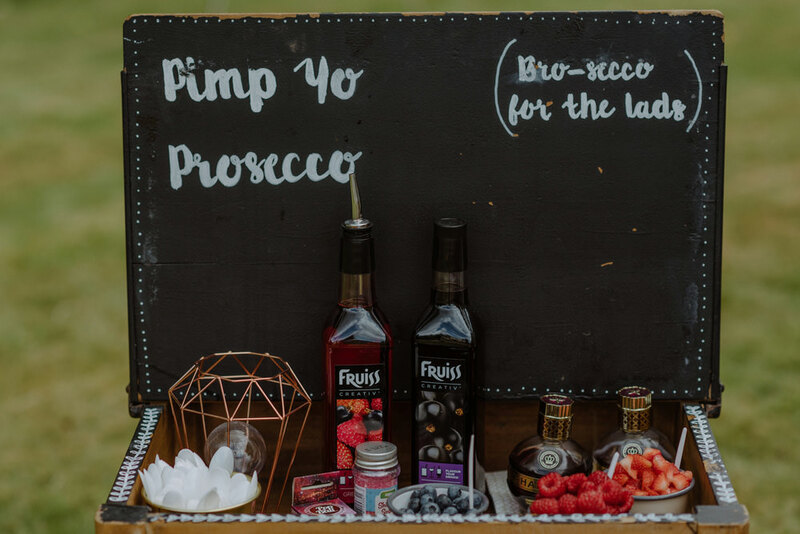 We ended up with over 50 bottles, which we dotted throughout the venue – they looked so cute at night with their lights twinkling. 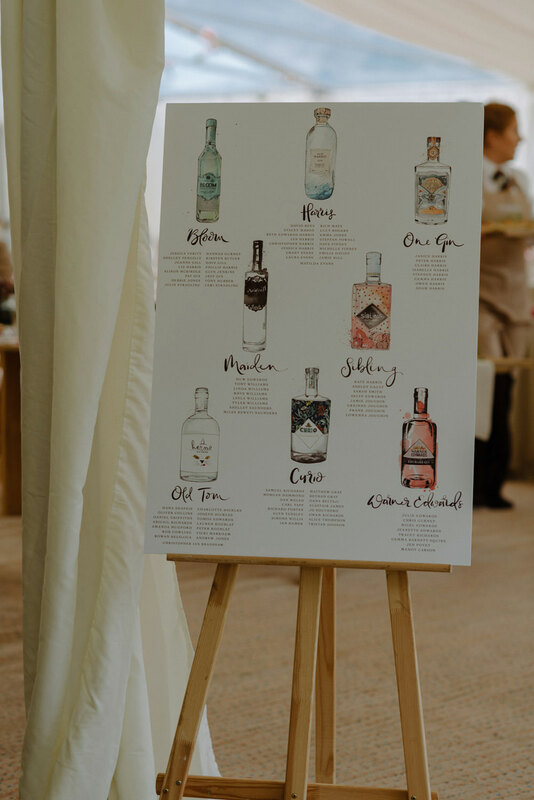 We auctioned most of the gin bottles off to our guests at the end of the wedding as a way of raising money for a charity close to our hearts. All of our on the day stationery was created by the immensely talented Harriet at Dewinton Paper Company. 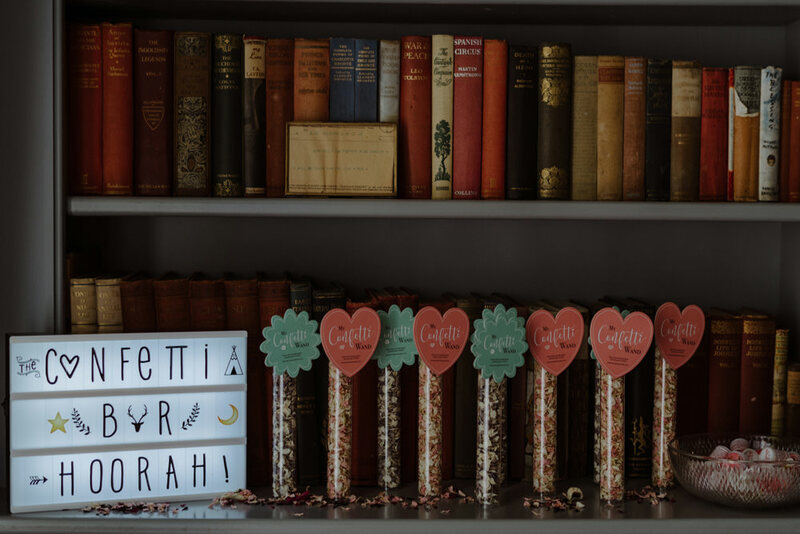 Harriet did everything from our save the dates, to our invites, orders of service, welcome signs, table plans and menus. I cannot recommend her enough. 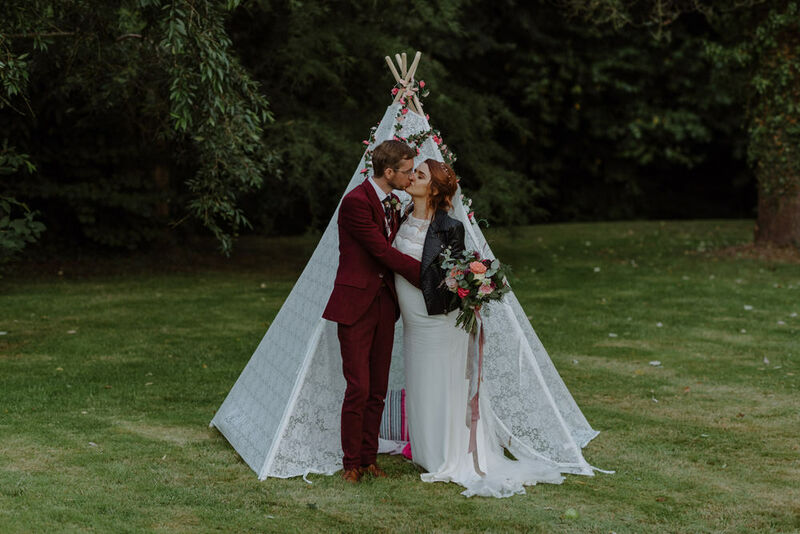 A big thank you must go to Kirsten from The Little Wedding Helper and Danielle from County Marquees who actually helped make all this vision come true by working over two days to set everything up! It was amazing to walk in to the marquee before the breakfast to see everything as a finished product after two years planning! 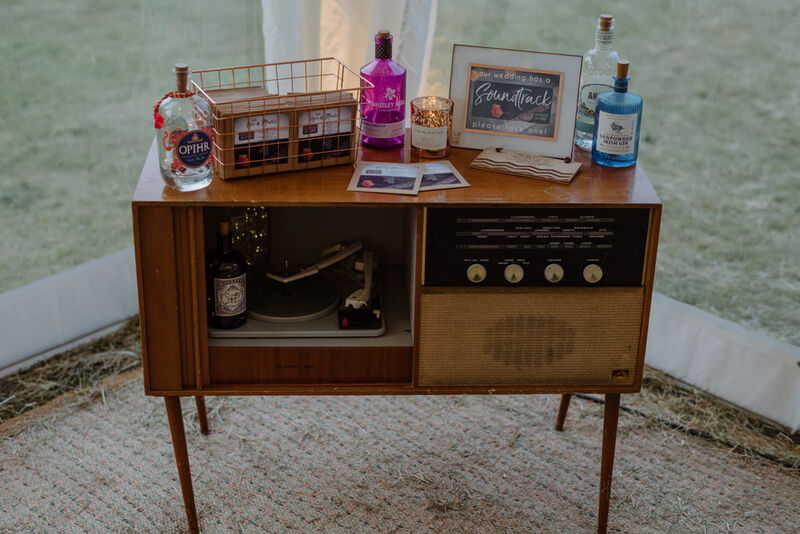 Kirsten also lent us her vintage record table as we made ‘soundtrack to our wedding’ favours. 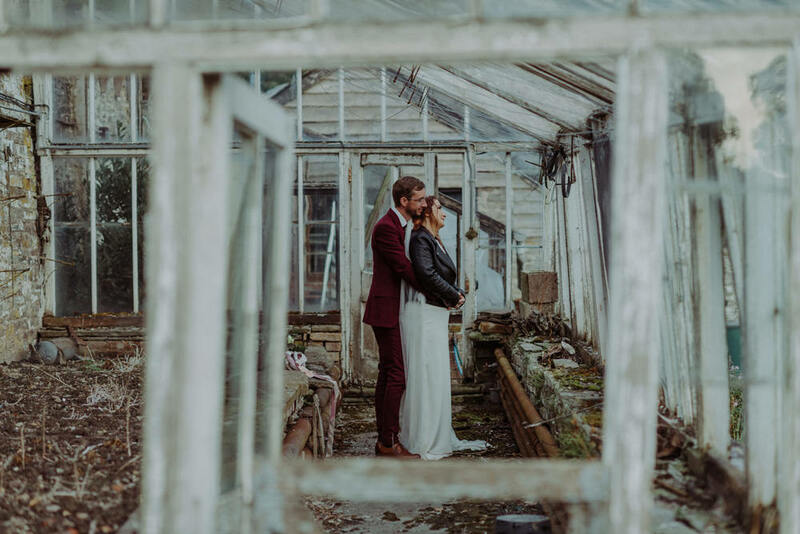 Straight after our wedding we headed just up the road to Hay-on-Wye. Our venue owners also own a holiday cottage, so we hired that for five days to unwind and relax post celebrations. It was a magical few days with a wood fired hot tub, no phone signal, and lots of left over cake! It was the most blissful location to open all our presents and cards, and begin married life. As for the main event, we have just returned from a three week trip exploring New Zealand’s north island (10/10 would recommend!) 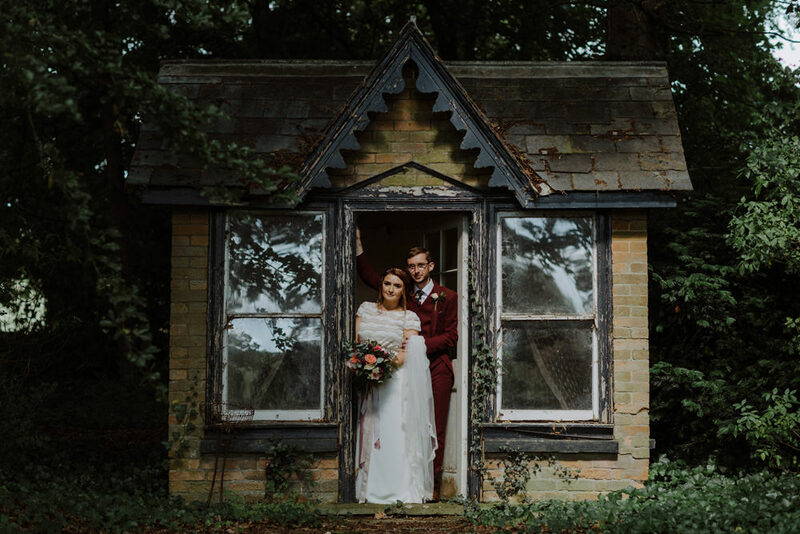 It was really nice to wait a little while before leaving for honeymoon, particularly as it meant we escaped January in the UK! Our entertainment. It was 100% worth investing in all our entertainers, as our guests still talk about them to this day! We hired Adam J Reeves to do close up magic during our canapé reception, and I can’t even begin to explain how mind-blowing he was. 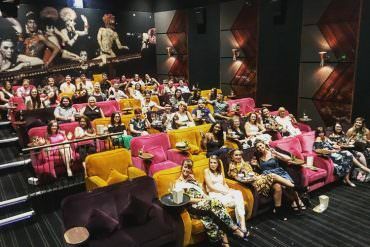 The best thing was how well he blended in with the guests, so they’d be really shocked when he began reading their minds!! In the evening Helen from Glitter-masque was on hand to give people glitter beards and rainbow faces, this went down really well! The gift Ian gave me for our wedding day had such a huge sentimental value to me, I don’t think I’ll ever forget opening it. I received a tiny little box with an ipod shuffle (!) inside, with a little tag saying ‘take a quiet moment to listen to the Morning lark.’ Turns out Ian (a musician) had written a song for me, and as I listened to it a robin landed on the windowsill of the room I was in, and stayed there until the end of the song. Of course the other memorable moment was simple being surrounded by our friends and family. 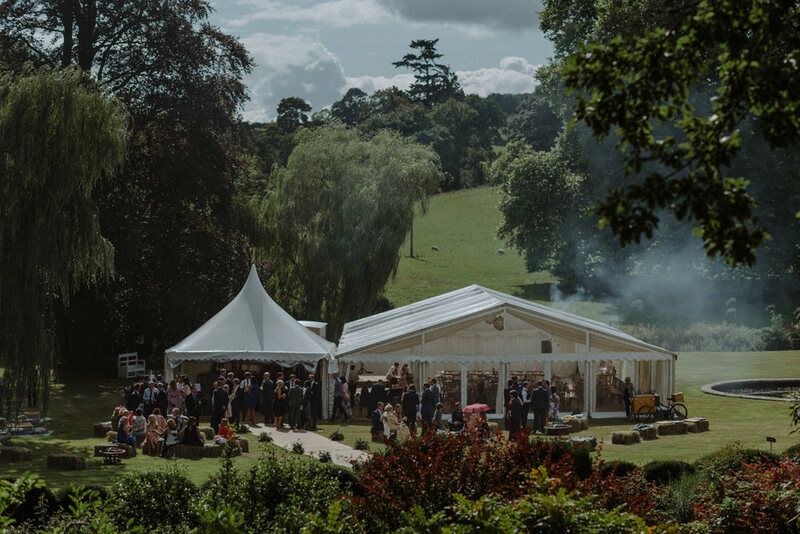 When we went to have our photos done we stopped at the top of the hill overlooking the venue and had a wonderful vantage point to see all our guests and the marquee. 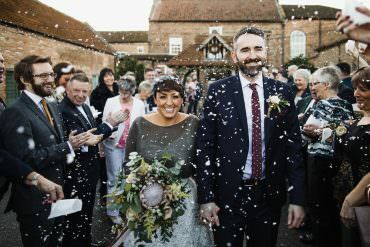 It was like looking down on a dream realised, and standing there as husband and wife looking at all our friends and family enjoying themselves was magical.